Our clear lexan wall guards are an affordable way to protect your walls from damage. They come with pre-drilled holes and screws for easy installation. 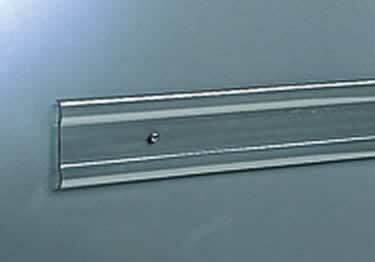 A surcharge of $15.00/per order will be charged for shipment of 8 foot wall guards. available in 3" x 8' or 4" x 8' pieces. Can these plastic chair rails be painted? How shatter resistant are these? We have metal framed, upholstered pew chairs (the ones that can be linked together) that we are trying to keep from scratching up the walls. Will this be able to withstand those metal frames hitting the Lexan and not crack the Lexan? Can these chair rails (clear plastic - Lexan) be cut to size? Do you offer this option when ordering? Thanks. Chair rail ideas can be enhanced with clear lexan® plastic. End wall damage now! Low cost, good-looking, and easy to install. This clear plastic chair rail is perfect for people with a wall area that is easily scratched or bumped into. Love it. Used this in our conference room and in several freshly painted offices. Looks great over either wallpaper or painted walls. Great solution for us. I purchased this for several conference rooms. Its easy to install, looks good and works well. We have ordered this in the past and it is great, easy to install and works to keep objects from hitting the wall and making marks on them. these clear heavy duty chair rails look fantastic with any decor and last a lifetime due to quality product used to make them. Second home and second purchase of these fine rails. We purchased this for our break room to keep chairs from rubbing the walls and it has worked out great. needed four feet of inconspicuous protection on our wall but didn't want to install the traditional chair rail. Located this on the internet and it suits our needs. Love that the paint still shows through while doing its job of protecting the wall. Easy to cut and install. Delivered sooner than expected too. Highly recommend. This Chair Rail Guard saves much worry about the protection of our wall/paint. This is a great product to enhance the look of your building while protecting it! From start to finish the order process was simple and professional. The product arrived on time and exaclty as specified. These textured corner protectors for walls are easy to install with aluminum retainer, provides true impact bumper protection.